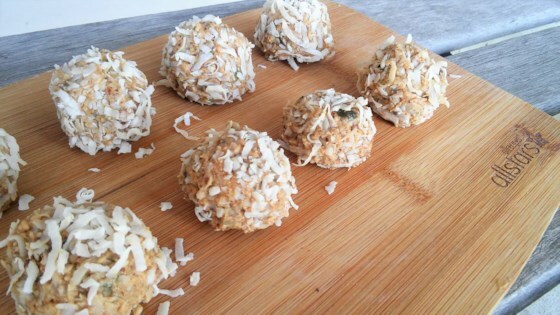 "This is my take on a healthy, protein-packed, energy-filled peanut butter ball. We all know nuts and seeds are nutritious, but getting them into your diet can be hard when eating them raw doesn't appeal. Here they add a lovely crunchy texture and complement the strong peanut butter taste. This is a great low-carb snack between meals or to satisfy an after-dinner sweet tooth. Make sure you use an all-natural peanut butter with no additives." Spray a small skillet with cooking spray; add sunflower and pumpkin seeds. Warm over low heat until they just start to brown, about 3 minutes. Remove from heat and transfer to a small bowl. Add peanut butter, almond flour, flaxseed meal, dark chocolate, and honey to the bowl. Mix well. Scoop out level tablespoon-sized portions of the mixture with a measuring spoon. Roll into balls with your fingers. Place shredded coconut in a shallow bowl. Roll each ball in coconut to coat. Transfer to refrigerator; chill until set, about 30 minutes. Substitute almond flour for the flaxseed meal if preferred. Use almond flour for rolling the peanut butter balls instead of coconut if desired. Store these in the refrigerator or freezer until serving.